We asked over 1,000 Americans how they plan to live healthier in 2019. Here are their New Year’s resolutions. Despite the low success rate of New Year’s resolutions, people continually make plans to eat less, workout more, and the like in hopes of living a healthier life. This year is no exception. 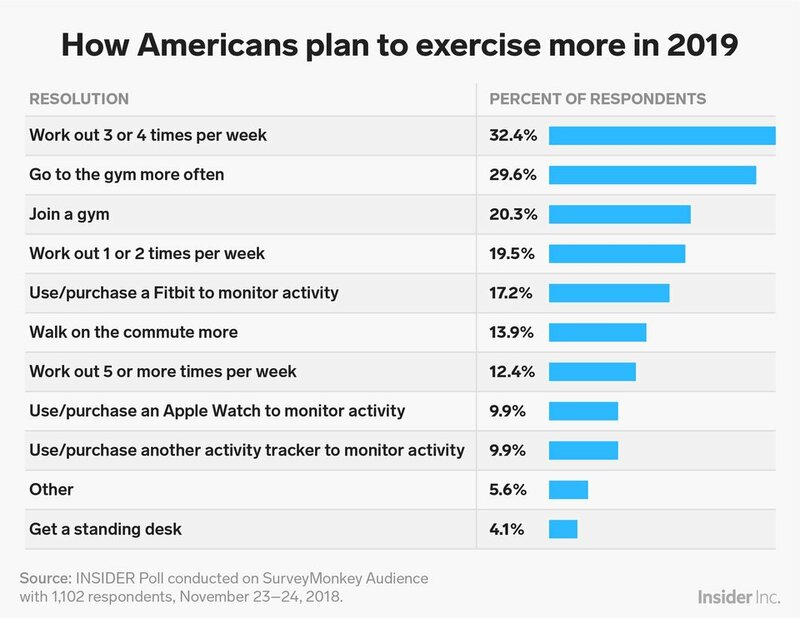 INSIDER recently polled 1,102 people about their 2019 resolutions, and the majority of respondents want to make health-related changed in the new year. INSIDER also asked respondents how they plan to achieve these goals. From losing weight via a specific diet to quitting smoking cold turkey, here is how Americans plan to live healthier lives in 2019. Of the 1,102 people surveyed, 473 said their resolution was related to eating healthier or dieting. 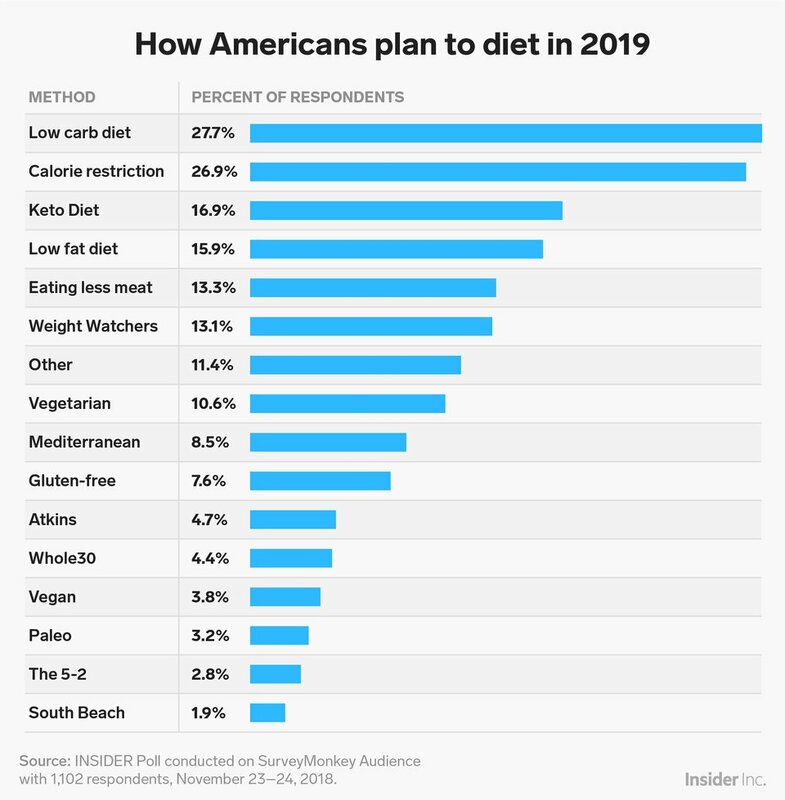 When asked which diet they were likely to follow, the top answers were a low-carb diet, calorie restriction, the ketodiet, a low-fat diet, and eating less meat. Though these methods may seem like surefire ways to lead a healthier life, they come with drawbacks and may not lead to the desired results. Low-carb and low-fat diets, for example, can backfire if people substitute restricted items with calorie-dense and nutrient-poor options. Although it wasn’t one of the top five methods, WW (formerly known as Weight Watchers) was also a popular choice among soon-to-be dieters. Founded in 1963, this program helps people lose weight and gain healthy habits using a points system. That is not to say it is without flaws. As INSIDER previously reported, WW is run by coaches rather than medical professionals. As a result, the advice is not custom to your health needs and is not always medically supported. Additionally, because of the program’s broad rules, it is still possible for followers to chose low-nutrient foods over nutrient-dense options. The second most popular health-related resolution was to exercise or be more active. When respondents were asked how they plan to achieve this, the majority said they would “work out three to four times per week.” (This was followed closely by “go to the gym more often.”) Provided each workout lasts 38 minutes, this goal meets the US government’s exercise guidelines of 150 minutes of moderate intensity aerobic physical activity a week. Many people simply want to start working out in the new year, either by joining a gym or exercising one to two times a week. While this is an admirable goal, is it also a lofty one. According to the New York Times, 65 percent of all people who begin an exercise program end up dropping out in three to six months. In order to avoid being part of the 65%, implement strategies that will help you stick to your new workout routine. In an interview with Health, celebrity trainer Tracy Anderson recommended holding yourself accountable by scheduling exercise time or enlisting a workout buddy. 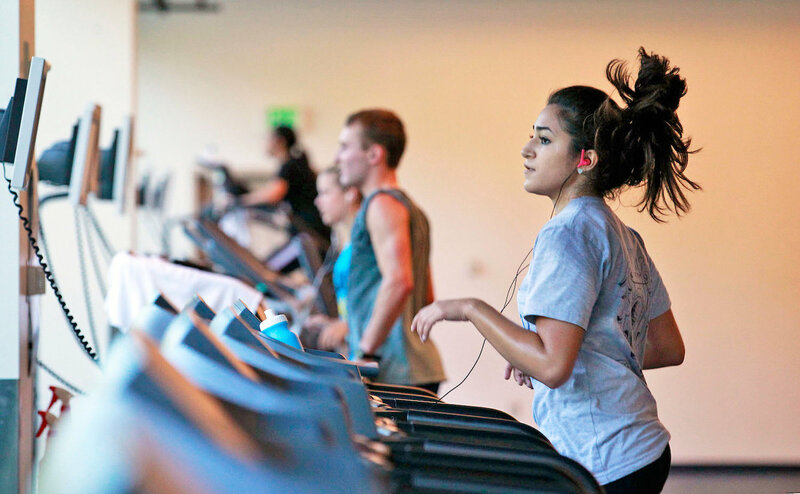 But not all respondents plan to be resident gym dwellers come January 1. A large number — 37% in total — plan to use fitness trackers in an effort to live healthier. Although these can be effective tools, they are not perfect. As INSIDER previously reported, fitness trackers aren’t always accurate for counting calories burnt. In fact, some are off by as much as 93%. Though not as popular as dieting and exercising, quitting smoking is a goal for 80 respondents. Of those, 37.5% plan to gradually reduce their cigarette use throughout the year. While taking gradual steps may seem like a fail-proof system, there are actually a number of drawbacks to this method. In an interview with Everyday Health, Pat Folan, the director of the North Shore-LIJ Center for Tobacco Control, says quitting cold turkey, which 33.8% of respondents plan to do, is actually a better option. 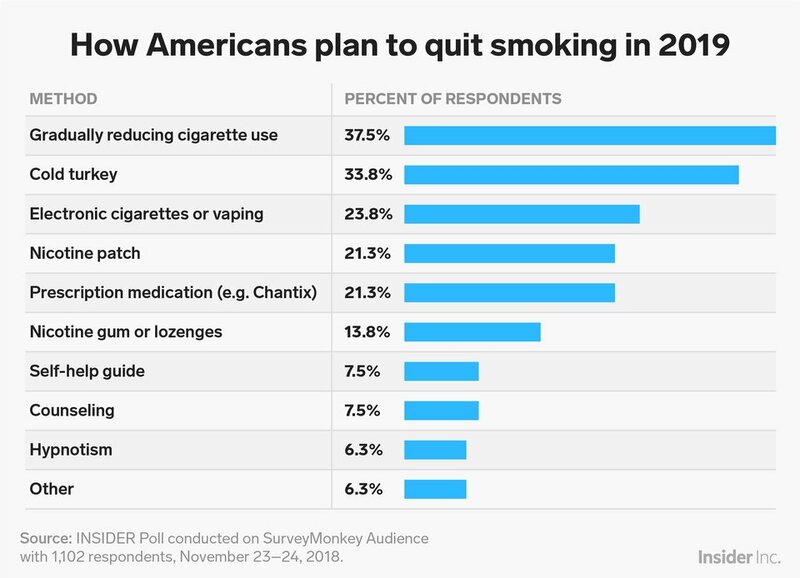 The third most popular method to quit smoking — e-cigarettes — also may not be as effective as people think. 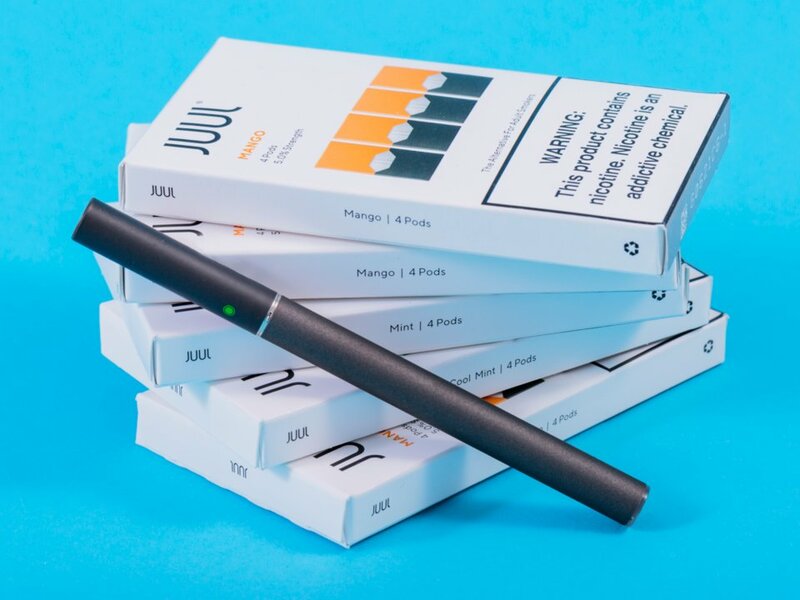 According to a July 2018 study from the University of California, San Francisco, people who use e-cigarettes as a method to quit smoking often end up becoming dual users. In other words, they smoke both cigarettes and e-cigarettes. This brings on other health issues, including breathing difficulty, as the study found. Even if one were able to quit smoking through the help of e-cigarettes, there are other risks to consider. A new study from JAMA found e-cigarettes contain high amounts of toxins like nicotin e, lead, cadmium, and pyrene. Additionally, there may be a link between vaping and increased risks of heart attacks.